1976's "Amigos" had seen Santana return to the rhythmic, Latin groove that had so characterised their first three albums, adding a pop sensibility. This album, the following year, continued in exactly the same vein. This album, however, has more soulful balladry on it and a little less of the Latin stuff this time out. 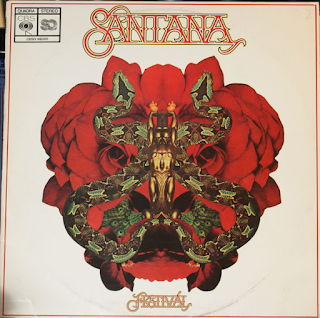 There is still Latin material, but I always think of this as Santana's first soul-influenced album. The album opens with the Latin carnival Spanish groove of "Carnaval". It merges seamlessly into the infectious vocal and sweet rhythm of "Let The Children Play". On vocals this time is Oren Waters, replacing Greg Walker. Once again the track eases into the next one, the frantic Latin percussion of "Jugando", augmented by Carlos Santana's first searing guitar solo. As we all know, this guy can play, if Santana albums from after "Santana III" are deemed to be a vehicle for Carlos's virtuosity, then so be it. He isn't all over this album, though, there are many other good points from its many other accomplished musicians. "Give Me Love" is a sumptuous laid-back, soulful ballad. "Verão Vermelho" is a delicious semi-instrumental, with some gorgeous acoustic guitar and a Brazilian title that hints at its Samba feel. A big rock riff introduces the pounding, organ and drum-driven "Let The Music Set You Free". "Revelations" has a quiet piano introduction before it moves into a slow, dignified guitar groove and then half way through Carlos ups it a bit and the percussion kicks in alongside his beautifully insistent guitar. 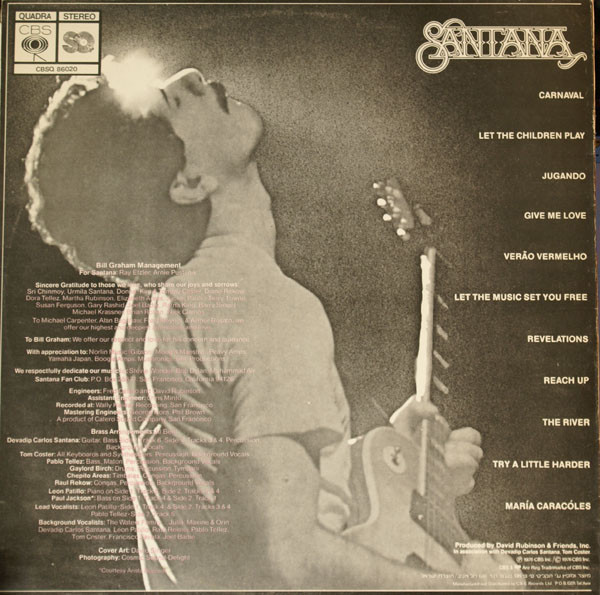 "Reach Up" is a melodic, slow soulful number and "The River" goes even further down that road with what is probably Santana's first true slow soul ballad. It has a lovely, relaxing vibe to it and a smooth, effortless vocal. The Latin party feel returns on the lively "Try A Little Harder Now" that basically repeats the same vocal refrain over some gorgeous bass and percussion rhythms. Santana's guitar near the end is excellent, of course. "Maria Caracoles" is a jaunty, brassy piece of Latin carnival fun. As the album had come in on a carnival thing, it had left on one, with some sweet laid-back soul in between. A nice album.